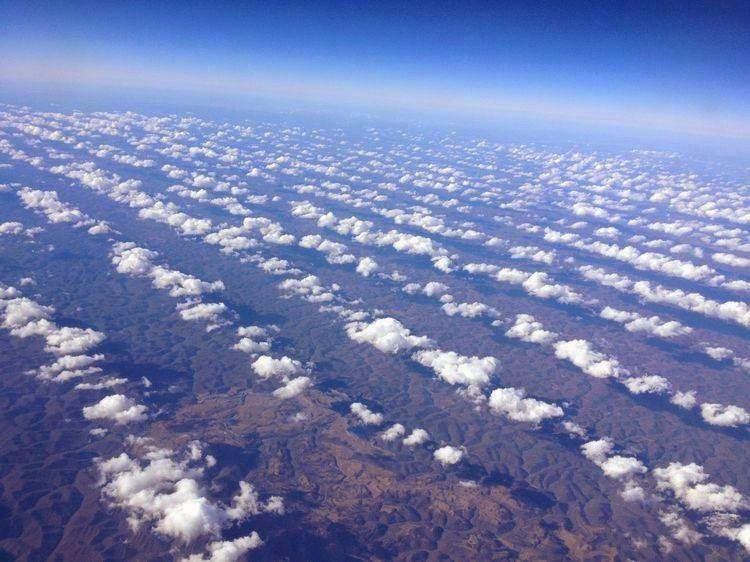 This photograph, taken by Seth Adams, shows lines of clouds over the southern Appalachian Mountains. It was taken at cruising altitude (approximately 30,000 ft or 9,144 m) during a flight from Pittsburgh, Pennsylvania to Atlanta, Georgia on January 14, 2014. Notice how the clouds are parallel with the ridges below them. Wind near the surface blowing up the western slopes forms waves in the atmosphere. At the crest of the wave, over the ridge tops, the air has cooled sufficiently to condense into clouds. As this air descends toward the wave trough, it becomes slightly warmer and drier, inhibiting condensation.